Andhra Pradesh launched the Rythu Runa Mafi Yojna in the year 2014 in which the first phase of this scheme was start on 11th December, 2014. The second phase of this scheme was start on 27th March, 2015. The third phase of this scheme was start on 9th October, 2017. Andhra Pradesh Government has decided to waive crop loans for the farmers on apcbsportal.ap.gov.in. You know as AP Rythu Runa Mafi List Status Cabinet of the recently formed government have a plan to given crop loan waiver in five instalments. Farmers get relief from this Loan. Several schemes are implemented for the people. Andhra Pradesh’s present CM N. Chandra Babu Naidu said that this program will be implemented in different cases. Through our this page, you can check the latest news and get the updates. such things are bonds, grant, debentures would be a backing. according to the scheme business will begin working from 22nd October. for more details regarding the AP Rythu Runa Mafi Yojna, people can be visit the website www.ap.gov.in. The state of Andhra Pradesh’s district Srikakulam, Vizianagaram, Visakhapatnam, East Godavari, West Godavari, Guntur, Krishna, Prakasam, Kadapa, Kurnool, Chittoor, and Anantapur. It is very easy to get the Andhra Pradesh Runa Mafi List of Crop Loan Waiver status, also you can be check your family loan status by search through Ration Card, Aadhar Card, Loan Account No. then enter the characters as shown in your related shown image. Then at last click on the Get Button. 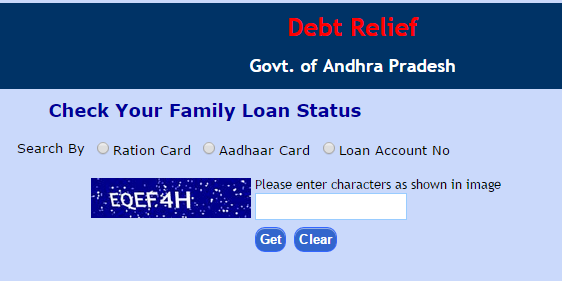 if you have any mistake for to checkout debt relief click on this clear button. This scheme Rythu Runa Mafi is stand for the all farmers. The farmer must be the citizen of Andhra Pradesh. The farmer’s Ration Card must be issued in Andhra Pradesh. The all farmers are not eligible for the scheme but the farmer who taken loan before 2014 will be eligible for this scheme. The farmers who are from medium and small condition will be eligible for this scheme. The farmers are not eligible for the scheme who are rich. Aadhar Card with Aadhar Number Link : Under the Scheme Aadhar Card and Aadhar Link are mandatory. Ration Card with Ration Card Number : Ration Card is required for the scheme. Ration Card Number is stand for to check the loan status. 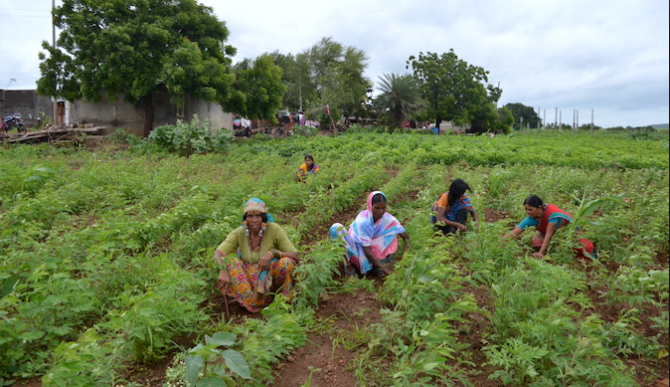 also farmers have to provide their loan related documents such as time of repayment, interest rates and loan amount. How to Download the E- Aadhar Card from UIDAI website ??? Aadhar is stands for the unique identification of the people. it is the unique identifier given to the indian citizen. Aadhar is the 12 digit random number issued by unique identification authority of india. any person is the resident of India can voluntarily enroll for AADHAR irrespective of their Age and Gender. that is the free of cost. E- Aadhar can be downloaded by the UID/ Enrollment Number and that is the form of an electronic version of Aadhar Card. Downloaded Aadhar Card is as an original card. in now a day’s aadhar card is most important it is required in all the level such as it is linked up with the bank accounts, ration card, election card etc. At everywhere a person does its transactions by using Aadhar card. The Aadhar card has the candidate’s personal details such as Photograph, DOB (Date Of Birth), Gender, Aadhar Number, Address, these all the personal information of each candidate would printed on Aadhar Card by the Unique Identification Authority of India. First of all Visit the official website UIDAI website for download the Aadhar card. Go to home page of the UIDAI website. Now, Click on the tab Download Aadhar. A page would be opened where the person has to enter the details of Enrolment Number/ Aadhar card Number, Full name of the candidate, Pin code of the area and Mobile number/ Phone number. After the person will receive an OTP (Online Transaction Password) on their entered mobile number. Enter the OTP (Online Transaction Password) as usual. Then take a print of the Aadhar card for further use. Click on the Aadhar website, that’s available here. Then Click on the tab Verify Aadhar Number. Then a new page would be opened where the candidate has to type their Aadhar Number and Enter Security code given. Now Click on the Verify tab. Then your Aadhaar verification was complete. here, This shows the Age band, Gender, State and Mobile Number on the Aadhar Card. Then Click on the tab Updating Aadhar details. Then a page would be opened where the information provided of the candidate who can use the portal, what information can be updated, Documents to be submitted along with update request etc. Click on the tab Click here to submit the updated details of the Aadhar Card. Then Login with Aadhar number, Data update request, Document upload and BPO service provider selection as step wise procedure. At last you seen your data has been updated. A person can check the online updated status details by clicking on the tab Check status updates done online. Click on the available Aadhar website. Now, Click on the tab Update request by post. here you can seen update request form. A update request form would be downloaded for the person. The person have to fill the Update Request Form and send it with the candidate’s signature and supported documents. Click on the entered Aadhar website. Now, Click on the tab Check Aadhar Status. Then a page would be opened with Check if Aadhar is Generated, where the person has to indicate their Enrolment ID and DOB (Date of Birth). Click on the tab Check Status. Then person will get the message if Aadhar is generated or not. A person can be update details at Update Enrolment Centre. also people can check the updated status at enrolment centre. people can check the entered their email ids and mobile number by using Check Email/ Mobile number. A person can be check link which is connected with the bank accounts by using this option Check Aadhar & Bank account linking status. Aadhar card is the main proof of linking in all the aspects of our life. in now a day’s Aadhar card has become the necessity for the every level of the life and very important apart of each person’s life. Andhra Pradesh Government has decided to waive crop loans with a public portal which can help the farmers and revenue officials to check the land records. You can check adangal, 1B, FMB, village map for personal and official purposes at meebhoomi.ap.gov.in. India have already commenced with the digitization of land records across the states behind the Andhra Pradesh and Telangana. So, The Andhra Pradesh Government has launched the Mee Bhoomi , that stands for to check the land records. All the farmers of the Andhra Pradesh can check their land records, land details, land status, village map along with the 1- B details, Adangal details effortlessly. also you can check the land records by downloading AP Mee Bhoomi Android App. For to check the land records at online the candidates must require Survey number, Khatha number, Number on Aadhar card, Passbook holder’s name. First of all Visit the official website meebhoomi.ap.gov.in. Then Click on Adangal and then click on the Mee Adnagal in the menu bar. Then you will see the Homepage of the website where you can see the Adangal option in which select the one option from these twice options Adangal or Village Adangal. If you was select the Adangal option then you have to select one from the given options – Survey number / Aadhar Number. Enter the Account Number or Passbook holder’s name. Now you have to fill the important details like District name, Zone name, Village name, Survey number and then enter the given Code /Captcha. After filling the details, click on the submit button for submit the form. mee bhoomi village map, Application form pdf and AP land records with survey numbers details. Then Select your District, Mandal and Village Name. Then you will Open this link. Enter the image displayed on the page. Click on the tab Click Cheyandi button. Also you can check the land records by downloading mobile app in which The land records of all 13 districts, Krishna, Guntur, Prakasam, Nellore, East Godavari, West Godavari, Visakhapatnam, Vizianagaram, Srikakulam, Kadapa, Kurnool, Anantapur, and Chittoor are available. Now you can See the Android add-on homepage of the website. Then you will start the download of the android app. The AP Government has considered the starting phase value of 1.5 Lakh per family. The left balance would be finished in upcoming years as per the condition announced by the AP govt. The state government will give the amount of 10 percent of the total amount which is on the balance as per the official message. you can get the details regarding all the phases which are set by the cabinet of the region. Funds will be mobilised from the different part, It also looks for increased the economic status of this community. On this page Be aware of the latest News on AP Government crops Loans waiver schemes for farmers. Loan Burden : The scheme is to waive off heavy loan burden that a Farmer is carrying. The state Government wants help to farmer to reducing down the loan burden. Budget : In this Scheme loan amount of the selected farmers will be reduced. State Government paid the rest portion of the loan on farmers behalf. Under this scheme The Government will be paid 3600 crore. Interest Rate : The Farmers who are eligible for the scheme will get relaxation in interest rates. Phases : In this scheme Phase are there and scheme will be implemented phase by phase. when first phase is over then next phase will be start.